A couple of weekends ago I had the pleasure of finally meeting the lovely Andrea, from Andrea’s Passions, for a very special dinner at Bob Bob Ricard – the home the famous Press for Champagne button. Anyone familiar with the restaurant will know that it can be very difficult to get a reservation at BBR, and so when we discovered that there was a 6pm seating we jumped at the chance! Well, when you’re at Bob Bob, there’s only one thing to do as soon as you sit down: Press For Champagne! 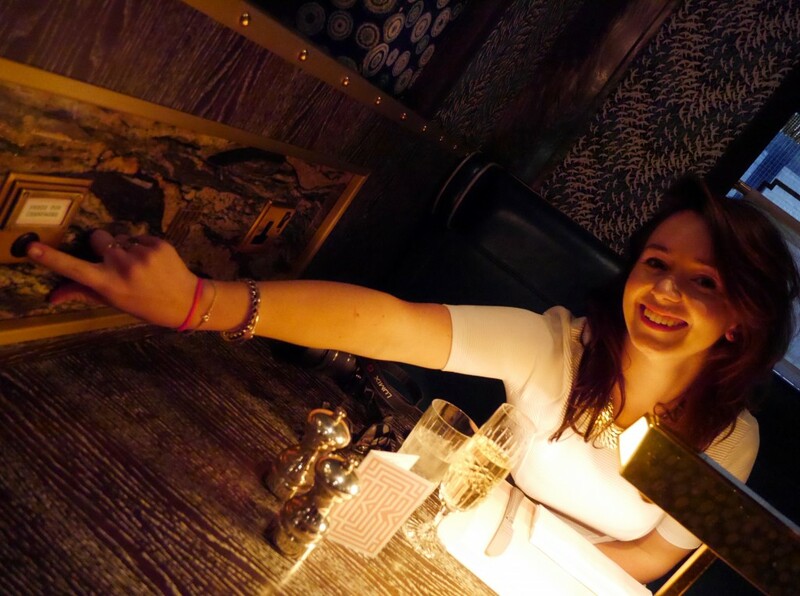 Bob Bob Ricard is a beautiful, glamorous restaurant in Soho, famous for its old school charm and its love of Champagne and all things luxurious – perfect for two lifestyle bloggers who adore champagne and treating themselves? We thought so! We were waited on by Raitis Logins, the restaurant manager, who was absolutely wonderful. He explained the menu, offered us some recommendations and generally took care of us in a very attentive, but not stifling way. He was always nearby when we needed him but never felt that we we’re being rushed. I’m going to get this little criticism over with pretty sharp, as the rest of our evening was wonderful – but there were quite a few tables left empty when we arrived, and during the entirety of our evening. We were in a side room that had four tables, but two of them remained empty for the entire night; a little annoying when you’ve had to take an early sitting. But, we weren’t going to let that spoil our evening! Being the snap happy bloggers that we are, we couldn’t resist a snap (or 20!) of that famous button. It really is wonderful – future home goals? I think so! The one thing I really loved about this restaurant is that attention had been paid to absolutely everything: even the water glasses were beautiful, heavy and in-keeping with the rest of the restaurant design. As soon as we sat down and had our champagne we immediately began gossiping and getting to know each other a little better – and as it happens, we have an incredible amount in common! And as we were celebrating Andrea’s early birthday – champagne was required, right? Even the place settings at BBR are beautifully presented and monogrammed with those famous initials. We both opted for fishy starters – a really gorgeous, yet simple, salmon tartare with cucumber, horseradish and fennel, which was delicious! Simple flavours, but the salmon was excellent quality and it really didn’t need anything else to show off its beauty. Andrea opted for the crab salad, with chili mayonnaise, cherry tomatoes and herb crostini. And boy oh boy, did I have food envy! I couldn’t have had a full serving as I’m not a mayonnaise fan, but the taste I had was delicious; bursting with flavour and still light enough to be a starter. After polishing our champagne off, we had a lovely bottle of white wine to help our main courses slip down! The old wine bucket was a thing of beauty – in fact, if my handbag had been large enough I might have tried to slip it out with me! But now for the main event..! I went for the classic chicken, mushroom and champagne pie, as recommended by Raitis, and I was in love – it was delicious, and not too heavy. Impressively, it also had the BBR initials marked into the pie crust. Oh so creamy, with a lovely flaky pastry – all in all, it was very well done. Sometimes simple but really well done food is the best, isn’t it? Andrea had the crispy pork belly served on red cabbage and apple puree with truffle gravy. And, well, it was as much of a showstopper as it sounds and looks! We were both a little apprehensive that the dish would be quite small, but we were pleased to be wrong; as you can tell the portion was rather generous. Okay, just one more photo of the totally delicious edible art that was main course! Now, I’m about to make a very bold claim here; but these might just have been the best parsnips and carrots that I’ve ever had. They were cooked in beef dripping, honey and thyme and were absolutely exceptional. I must admit, I’m really not a mashed potato fan – I never have it at home and didn’t think twice when I saw it on the menu, but Andrea ordered a side and said it was wonderful! She said they were “buttery and smooth, but not overly rich“ – which sounds like high praise to me! I have to say, there’s wasn’t a drop of food left on our table – we make a pretty good dinner combo! If you’ve been reading my blog for a while now, you’ll know how much of a sweet tooth I have – in fact, most of my recipes are probably sweet treats! Knowing that BBR was famous for its melting signature dessert, we couldn’t resist ordering it! I loved this dessert; the chocolate was superb, the fresh fruit, brownie and chocolate mousse inside were divine and I even enjoyed the passion fruit jelly in the middle! Also, after quite a heavy main course, it was light enough that I could get my sugar fix without feeling overly full at the end of our meal. As we were celebrating an early birthday, the restaurant kindly brought Andrea a sweet treat in the form of an ice cream cake. However, as pretty as it was – and as sweet as the thought was – it really didn’t taste great at all. We both thought it was poorly done, and would have been better writing “Happy Birthday” on another dessert that she had ordered. Not feeling entirely satisfied, Andrea ordered the chocolate fondant with milk ice cream, chocolate almond brandy snap and mint crème anglaise. It looked divine – I was far to full to even contemplate eating any more – so I left Andrea to do the taste test for me! The fondant was very well done with a sponge-y outer and a melting middle, but the mint crème anglaise didn’t go down so well. Maybe give it a miss if you order this otherwise delicious dessert. Not feeling quite ready to leave yet, we decided to press the button just one more time (it was only fair that we both got to press the button!) and ordered a glass of prosecco each. 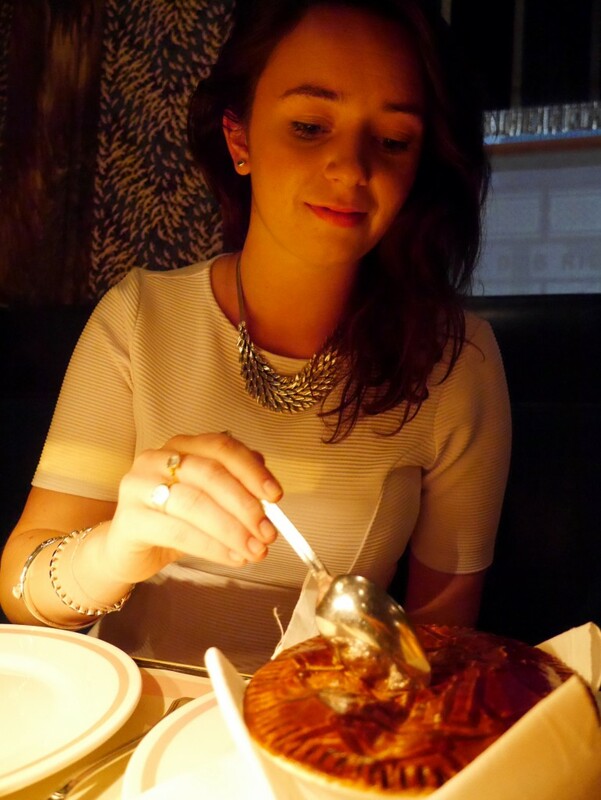 We gossiped the night away, had a great giggle – and have already pencilled in our next dinner date! What can I say, we really do have a lot in common! After saying goodbye to Raitis, and taking some last minute snaps of our wonderful evening – including these lovely photos outside the restaurant itself – we wandered off into the beautiful summer’s evening. ..and nipped into Roka, Charlotte Street where Andrea has a shochu (delicious Korean/Japanese spirit – which is strong and deadly, but extremely tasty!) jar for a couple of drinks before the night was really over. It was a little pricey, but that was to be expected, and I think it was well worth the money we spent – we really did have a great night! The food was excellent on the whole, the service was great and, well, who can say no to Press For Champagne? I think I know where I’ll be going for my next special meal!